Charles Stuart (25) on the Parker Transport Yamaha R1. Irish Superbike champion Charles Stuart won’t mind if it rains on Saturday at the JAS Finlay Sunflower Trophy meeting at Bishopscourt. 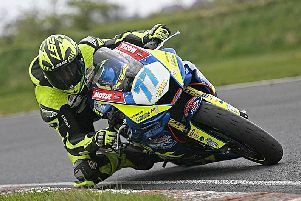 The Ballycastle man, who clinched the championship at St Angelo, is hoping to finish the short circuit season with an impressive result in Co Down, when Stuart feels some wet weather would level the playing field against British championship stars Glenn Irwin, Michael Laverty, Danny Buchan and Alastair Seeley. Irish and Masters Supersport champion Jason Lynn. The former off-road rider, who will line up on the Parker Transport Yamaha R1 that has served him so well this season, said: “The Sunflower Trophy race meeting is the big one, the end-of-season race where everyone looks forward to getting a good result. “My sponsor Gerry (Parker), whom I’m indebted to, was hoping to have something more competitive sorted for this event, but it was a race against time and I’ll just stick to what I have. Lisburn’s Carl Phillips produced a strong ride to finish eighth in the final round of the British Superstock 1000 Championship at Brands Hatch last Sunday and also has aspirations of ruffling the feathers of the fancied frontrunners. “But I’m really looking forward to the Sunflower Trophy races this year and I’ve been getting plenty of time on the bike. I recently had a run out at Anglesey, finishing third overall. Phillips linked up with Isle of Man TT star Michael Dunlop for 2017 to ride a Suzuki under the MD Racing banner. Upperlands man Jason Lynn is another leading domestic rider who hopes to make a big impression this weekend. Lynn added the Irish Supersport title to his Masters Supersport crown at St Angelo on his trusty Walter Bell Suzuki and is set to debut a new Yamaha R6 at Bishopscourt, which he will ride in 2018. “This will give us an opportunity to try out the bike in race conditions before the 2018 season,” said Lynn. Practice gets underway on Friday from 9:15am. On Saturday, the opening race is pencilled in for 10:45am. Admission is £10 on Friday, £15 on Saturday or £20 for both days.